Many people who know boxing say it’s a crazy sport and how the competitors involved have to be at least part crazy to want to fight, to take punches, to sacrifice so much, for the means of making a living. Maybe boxing fans, or a good deal of them, are also crazy. Just this past weekend, we saw two top class fighters going into battle against the elite of their respective division, this whilst being considerable underdogs themselves. The two fighting men in question being Chris Arreola, who was as game as they come against WBC heavyweight ruler Deontay Wilder, and super-bantamweight “Jazza” Dickens, who tried his best again WBA king and pound-for-pounder Gulliermo Rigondeaux. Arreola was forced to retire on his stool after eight-rounds, while Dickens was forced to stay sat down at the conclusion of the second-round of his fight. Arreola suffered a badly swollen left eye, a cut above his right eye, and he shipped considerable punishment from the man who has now registered an amazing 36 KO’s or stoppages. Dickens, he suffered a broken jaw. Despite this, some fans, too many actually, have been as disrespectful, as crass and as ignorant as to call both losing fighters quitters. The world today is full of so-called “keyboard warriors,” or “internet tough guys,” – people masquerading as fans who are way, way, way too quick to hurl the quitter tag at a fighter who must go through the kind of pain, suffering and exhaustion they could never, ever even imagine experiencing. Okay, it’s fine having an opinion, and if a fighter shamelessly quits, then go ahead and criticise. But a great fighter seldom flat-out quits; it is almost always the corner doing the deed, so as to protect a badly beaten, even injured fighter. Arreola is a great example. Never can the tough Mexican/American, who has often appeared to care almost nothing for his own safety in fights – so willingly does he go to war and trade punches with his adversary – be labelled a quitter. 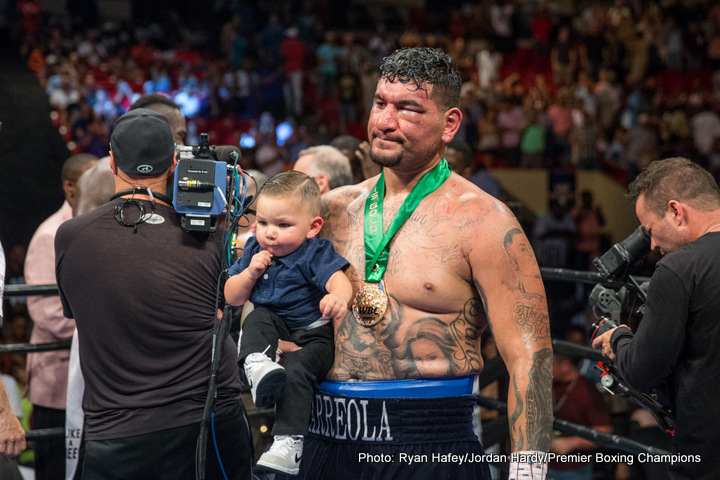 Arreola’s coach Henry Ramirez will tell you that during the two times he and he alone made the decision to pull his fighter out of a bout he was losing – against Vitali Klitschko in 2009 and against Wilder this past Saturday – his warrior would gladly have gone on had he permitted it. And who of the “internet tough guys” has ever suffered as nasty an injury as a broken jaw, the kind Dickens suffered on Saturday night? If these guys insist on calling ALL fighters who remain, or are forced to remain, on their stool at the termination of a fight a quitter (such an ugly word in boxing, the single most demanding and dangerous sport in the world) they must include the following legendary and legendarily tough all-time greats: Muhammad Ali, Joe Frazier, Sugar Ray Robinson, Thomas Hearns, Oscar De La Hoya, Arturo Gatti and others. As any sensible fan will agree, to hurl such an accusation at any of these fistic heroes to millions is, well, crazy. Did Ali really deserve to be called a quitter when his caring trainer/corner-man Angelo Dundee pulled him out after the 10th-round of his ill-fated, never-should-have-happened fight with Larry Homes? Of course not. Was the almost blind Frazier a quitter when Eddie Futch gently sat him back down on his stool after 14 hellish rounds against Ali in Manila? No way. Should the original Sugar Ray, arguably the finest fighter in all of boxing history, have been called a quitter for remaining on his stool at the conclusion of the 13th-round of his challenge of the much bigger Joey Maxim, in a fight that was contested under blistering heat of 103 degrees? Again, of course not. What about the ultimate warrior, Arturo Gatti – was he a shameless quitter for being pulled out at the conclusion of the 5th-round of his beating at the hands of the sublime Floyd Mayweather Junior? Tommy Hearns, the battle scarred version, when, aged 40, he could not stand up due to a nastily twisted ankle of his cruiserweight affair with Uriah Grant? And the list goes on. Basically, if a fighter is a beaten man, if all hope is lost, there is nothing to be ashamed of in him retiring and looking to come back with a vengeance another day. Again, great fighters rarely CHOOSE to quit. It does happen, of course. The best example of a great boxer capitulating by his own devises and deservedly being criticised as a result is Roberto Duran, when he threw up his arms in disgust and left the paying fans feeling that way in the infamous rematch with Sugar Ray Leonard. The critics can have that one, Duran was never hurt, he was running Ray close on the cards and had no reason to quit. Maybe you can add the name of Don Curry, who should have sucked it up and tried to fight back against a wild Lloyd Honeyghan, instead of crying foul tactics after six-rounds in that tremendous upset of 30 years ago. But guys like Arreola, Dickens, Ali, Robinson, Hearns, et all – they are no way deserving of the seemingly ubiquitous quitter tag. Maybe the fans who have access to a keyboard and not much more should think twice before they refer to any fighter as a coward.